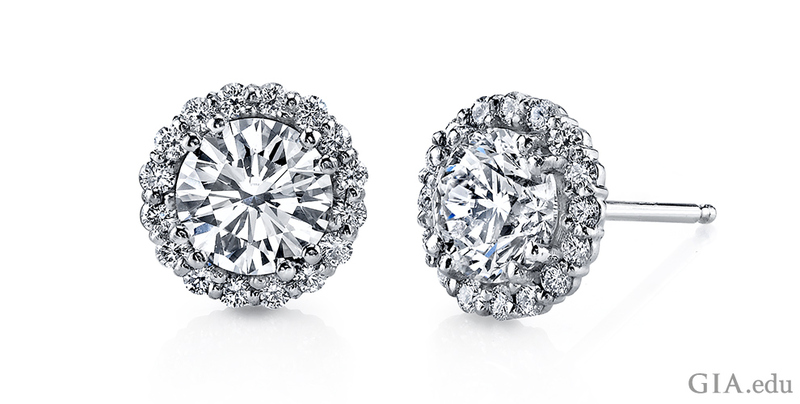 Diamond stud earrings can dress up your look. They add a splash of style to any outfit. And turn heads. Just ask trendsetter Meghan Markle, now the Duchess of Sussex. 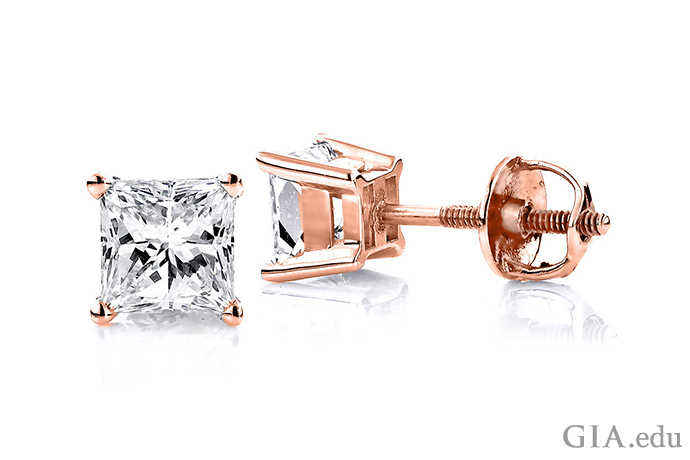 Here’s how to choose a pair of diamond studs you’ll love. Earrings are ancient. Men and women have worn various types of ear ornaments for five millennia. An early form of stud earrings was popular in ancient Egypt. 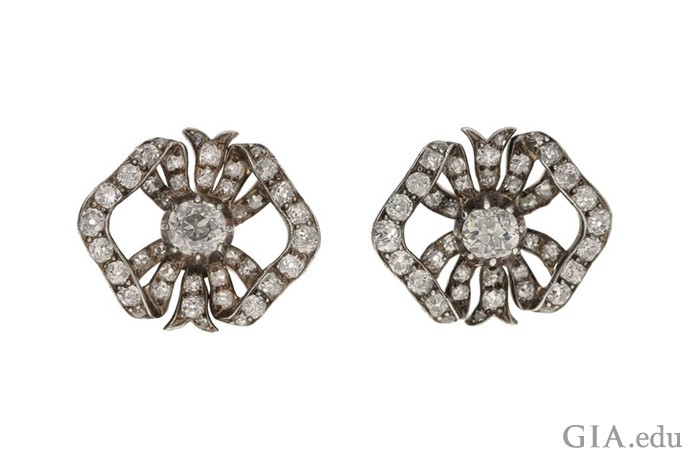 Modern diamond stud earrings made their appearance in the latter part of the 19th century – and they’ve had staying power. Their popularity surged in the 1970s, and they have remained a fashion staple ever since. Now diamond stud earrings have cross-over appeal – you’ll see many athletes and celebrities wearing them as single earrings and in pairs. Simple studs are required for the clean but edgy look currently favored by those who have multiple piercings on one or both ears. If you’re wondering how trendy they are, fashion-setter Meghan Markle, now the Duchess of Sussex, was recently spotted wearing diamond stud earrings. The 18K white gold ones she sported had a pendant jacket attached to the back that curved beneath the lobe to support another, larger diamond. When she married Prince Harry on May 19, 2018, Meghan Markle chose Cartier diamond stud earrings to accessorize her wedding gown. The 18K white gold Galanterie de Cartier earrings are set with a round brilliant cut diamond in the center surrounded by interlacing curves of bead set melee diamonds. 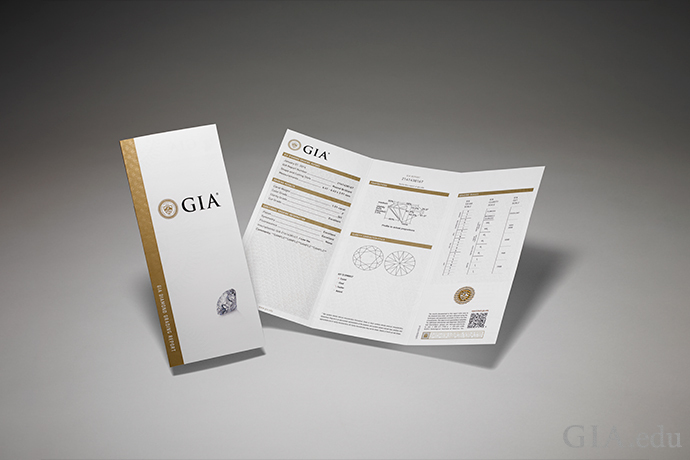 The GIA 4Cs – color, clarity, cut and carat weight – are the universal standard for evaluating diamond quality. Quality is tied to price, so consider the 4Cs your best friend in helping you find diamond stud earrings that are not only beautiful, but also the best value. When picking a diamond, you want to get the best quality for the price your budget allows. And when you’re buying diamond stud earrings, multiply that times two. The good news is that, unlike a diamond solitaire engagement ring, where the tiniest detail matters, you have a little more leeway in selecting diamonds for stud earrings. Color: The facets on a diamond are like tiny mirrors, reflecting what is close to them. That means the diamond will pick up the color of the metal it is set in, your skin, your hair and anything near it, like glasses or other earrings. All these will affect the perceived color of the diamond. So, choosing a more expensive colorless diamond is less important. You can save money by choosing a diamond that’s lower on the D-to-Z color scale. Clarity: It’s unlikely that anyone will be able to spot inclusions and blemishes on your diamond stud earrings – unless they’re close enough to examine your earlobes with a 10× jeweler’s loupe. Diamonds on the lower end of the clarity scale – Slightly Included (SI1 and SI2) or Included (I1, I2) can be a good value, allowing you to spend more on the next two Cs. 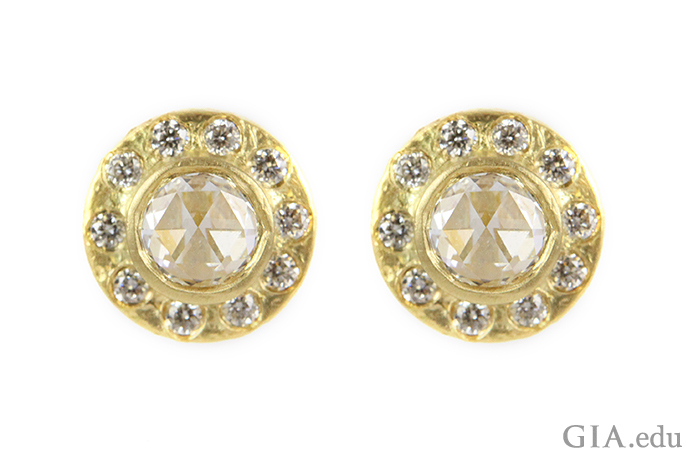 Cut: You’ll want your diamond stud earrings to sparkle and pop, and that is largely a function of diamond cut. A brilliant cut facet arrangement will provide the most sparkle, so look for a diamond with this cutting style. If you choose round brilliant diamond studs, make sure the diamonds have either Excellent or Very Good cut grades from GIA. This will ensure that each diamond has the proportions, symmetry and quality craftsmanship to deliver the sparkle you expect. 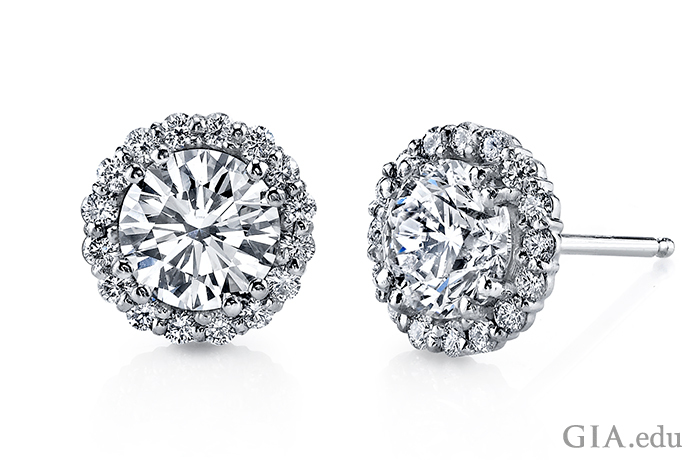 Carat Weight: Diamond stud earrings are about making an unforgettable impression. If you can afford it, try to get diamonds 0.50 carat (ct) or larger (of course, you’ll need two). Remember, too, that you can save money with little loss of impact by choosing gems that are a few points below the magic sizes of 0.50 ct, 0.75 ct, 1.00 ct, etc. But don’t use carat weight as your only criterion for making a decision. A poorly cut diamond won’t have much brightness, fire or scintillation. It will look dull and lifeless – hardly the statement you want to make. Likewise, a diamond that is too low on the D-to-Z color scale may have a pronounced yellowish or brownish tinge. And an I3 diamond may appear darker or more opaque. Still not sure about prioritizing the 4Cs? 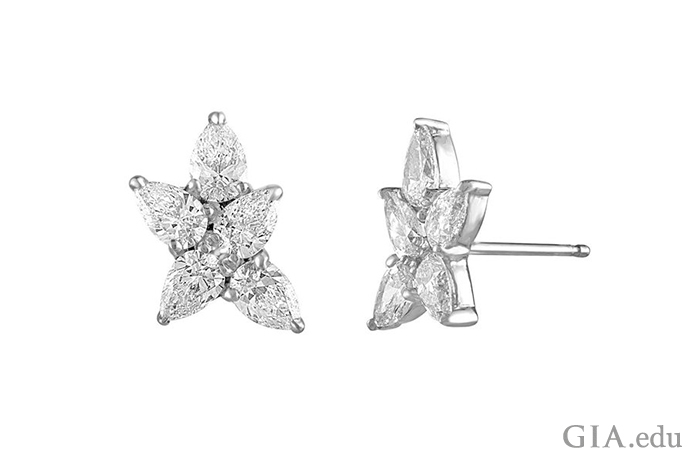 Check out What’s the Most Important C.
You’ll find diamond stud earrings in a variety of shapes and cuts. Each has its own unique charms and appeal. Because of this, there is no objective best shape or cut. That said, here are two popular cuts for diamond studs. Round brilliant cut. The round brilliant cut is the most popular for diamond engagement rings. It also has maximum brightness, fire and sparkle in a colorless diamond. 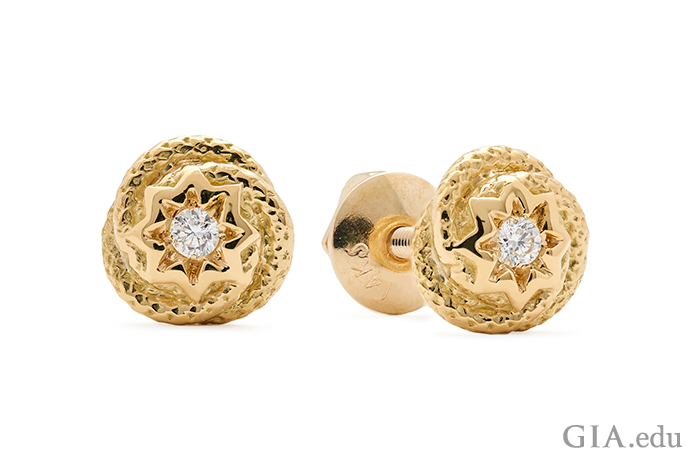 This makes it a popular choice for diamond studs. The more diamonds, the more sparkle. Surrounding a round brilliant cut diamond with a halo of diamond melee means more bejeweled fireworks from one of the most popular cuts for diamond stud earrings. Courtesy: evelynH. Jewelry Inc.
Princess cut: The square shape of most Princess cut diamonds can make them look a bit edgy when used as diamond studs. Since the Princess cut has a modified brilliant facet arrangement, these diamonds typically have exceptional sparkle and scintillation. 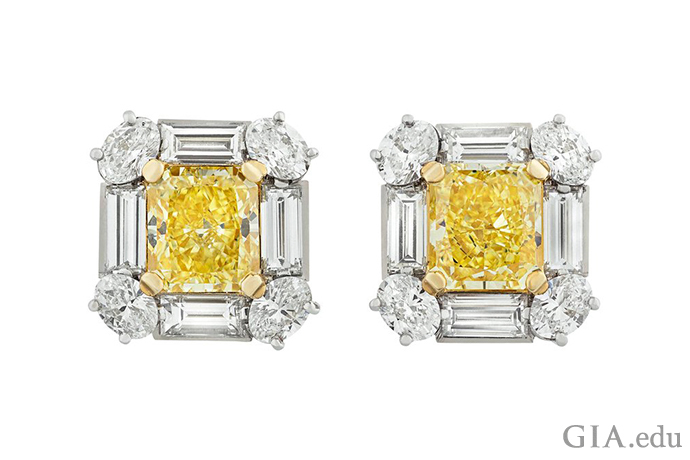 There are three things to consider when picking a metal to pair with diamond studs: color, weight and wearer allergies. Here’s a closer look at these three factors. In an earlier blog, we explained how metal color affects a diamond’s color appearance. The essential concept: Because diamonds are highly reflective gems, the color of the metal surrounding them will influence their apparent color. 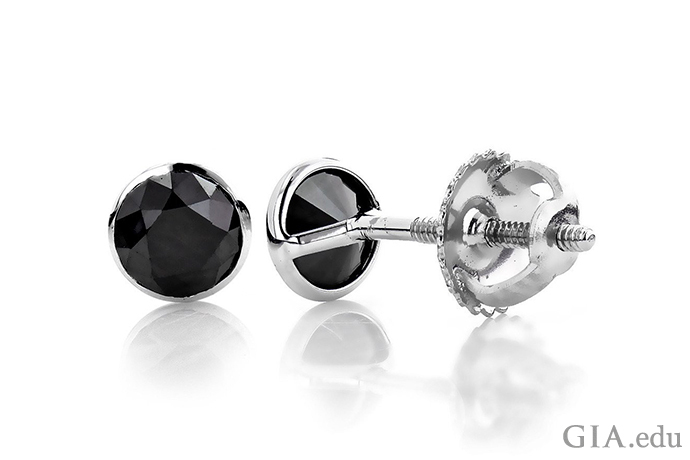 You can use this to your advantage to create contrast or harmony in your stud earring style. Want a bright white look? A white metal (white gold or platinum) is an excellent choice for diamonds with color grades of D through J on the GIA D-to-Z Color Grading Scale. A white metal will enhance the fact that these diamonds are colorless or have only a hint of yellow. Want a softer look? Diamonds graded M–Z, which have a noticeable yellowish tint, go well with yellow gold and rose gold by harmonizing with the color of the metal. You can also create contrast by pairing these diamonds with a white metal. 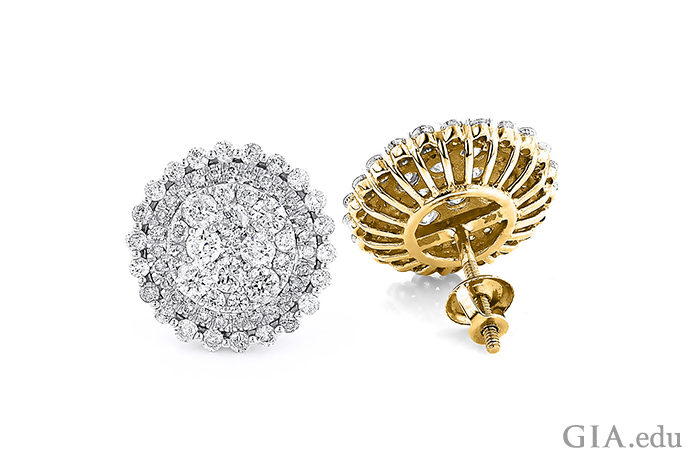 For diamonds with a color grade of K or L, you can use either yellow gold or a white metal, depending on the effect you want for your stud earring setting. Unless the setting that holds the diamond is exceptionally large, you’re not likely to notice if diamond stud earrings are heavier or lighter because of the metal used. However, if weight still concerns you, we offer some guidance. Because platinum is denser – that is, has a higher specific gravity (mass ÷ volume) – than gold, the same earring setting will weigh more in platinum than it will in gold. Precious metals like gold and platinum are mixed, or alloyed, with other metals to give them strength and durability. Platinum alloys are usually 90–95% pure, while gold is usually 58.5% pure (14K) or 75% pure (18K). Alloy metals – such as copper, nickel, palladium and zinc in white gold – have a lower specific gravity than gold and platinum. Because more precious metal is present in the platinum alloy, it has a heavier feel. Again, though, the amount of either gold or platinum used in most stud earrings is small enough that the feeling on the ear is usually negligible. Many people have allergies to some of the metals used in gold alloys, such as copper or nickel. If you are extremely sensitive to these or other alloy metals, avoid yellow, white or rose gold. Platinum, however, is hypoallergenic. You can wear it without fear of irritation or an allergic reaction. Platinum is the safer choice if you have metal allergies. Settings play a dual role in any piece of jewelry. Practically, they hold the gem securely in place so you can wear it without fear of loss. Stylistically, settings offer unlimited creative possibilities for displaying the gem to its best advantage. When it comes to diamond stud earrings, you’ll want to consider which settings offer the maximum sparkle, enhance the size of the stone and provide the best protection. To get the most sparkle out of your diamonds, put the least amount of metal on the stones. Less metal equals more diamond visible to the eye. 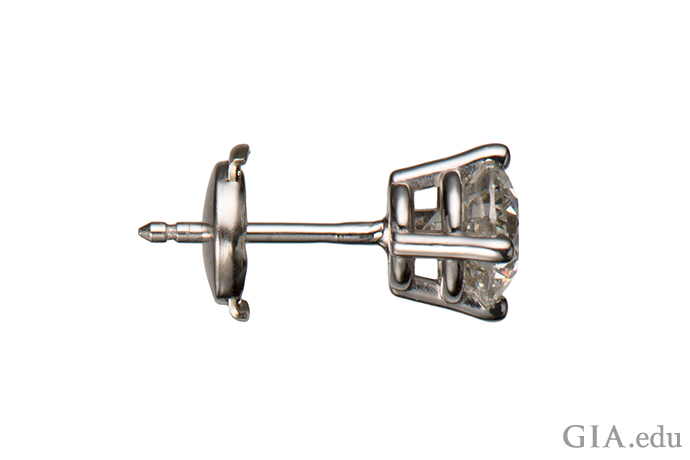 A setting with three of four prongs would be an eye-catching choice. For smaller diamonds, consider adding a halo of diamond melee. Or encase the diamonds in a white metal setting that will complement their colorlessness. Prong settings can also maximize the size of a diamond, since they cover the least amount of diamond surface. So, if you’re going for size, go for a prong setting to expose as much of the diamond surface as possible. Even though diamond ranks 10 on the Mohs scale of hardness, making it the hardest gem, it still can be chipped and scratched. However, diamonds worn as earrings won’t be subject to the same wear and tear that rings and bracelets receive. So the main security concern is that the diamonds won’t fall out of their settings. Generally, settings that cover the least amount of diamond area maximize diamond size, but they also offer the least amount of protection. The most protection is offered by a bezel setting, whereby a thin metal strip is pushed or hammered around the gem to secure it. Although the bezel’s metal covers part of the diamond’s surface area, a white metal bezel can make a colorless gem look larger while it holds it in place. Before making a purchase, consider the security offered by screw backs and locking earring backs, like La Pousette backs. These are the two choices that offer the most security. Other options, like friction backs, come in a variety of sizes from jumbo to small, but they usually do not offer as much protection from loss. A word about how to make sure earrings sit flat and don’t droop. Drooping earrings have less to do with the earlobe and more to do with the size of the earrings and whether or not an appropriate size back is being used. Larger earrings tend to be heavier and will droop if the earring backs are too small. Make sure the backs are large enough to support the size of the diamond studs. Smaller backs can be used with smaller, lighter-weight studs. However, some shoppers still prefer larger backs because they can be easier to handle. You can spend anywhere from $100 to $30,000+ for diamond stud earrings. So how much should you spend? Ultimately, it’s a personal choice that reflects your preferences and budget. If the size and quality of the diamonds doesn’t matter to you, expect to pay less. 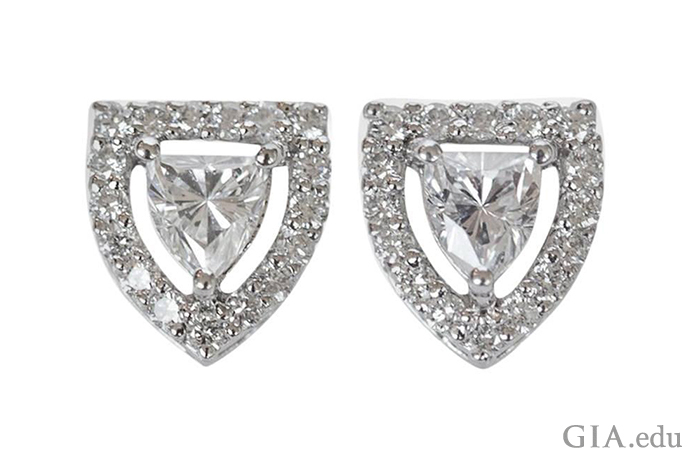 If you want large, colorless diamond studs free of inclusions and with an Excellent cut grade, expect to pay more. If the price of diamond stud earrings surprises you, remember that you are purchasing two diamonds and the designer must make sure their 4Cs match. 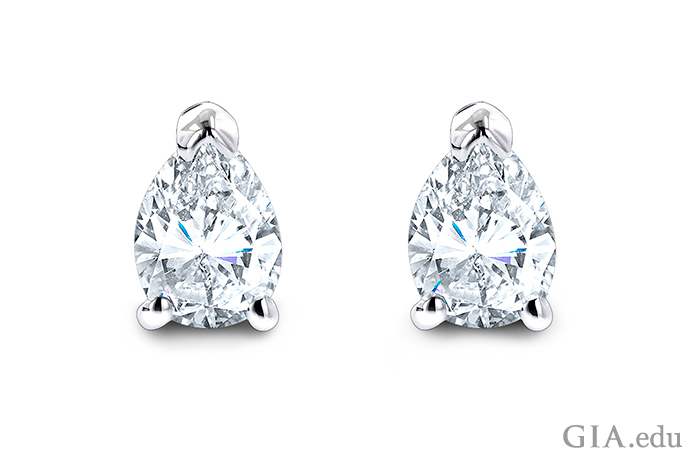 You’ll have two main choices when it comes to buying your diamond stud earrings: a jewelry store or an online retailer. 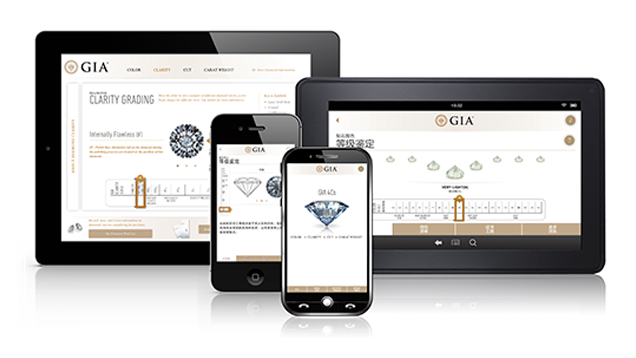 If you want to purchase from a jeweler, you can find one who carries GIA graded diamonds or has GIA graduates on staff by visiting GIA Retailer Look Up. If you want to buy online, read our tips on the Five Non-Negotiable Rules for Buying Jewelry Online. One key takeaway: Make sure your purchase can be returned or exchanged if you are not satisfied. To know the 4Cs of the diamonds in the stud earrings you’re admiring, insist on a GIA Diamond Grading Report. 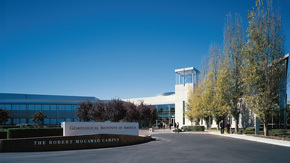 Since diamonds submitted to GIA are meticulously graded, you can be confident in what you’re buying. For peace of mind, look for diamond stud earrings that have a GIA Diamond Grading Report. Looking to add more timeless jewelry to your collection? Don’t forget about pearls. Check out Pearl Jewelry Essentials: Five Easy Pieces.